So Thursday night I got a call from Douglass. His car had broke down and he was needing a ride. Within the past few weeks, his 11 year old car had started acting up. The fix was easy, the relay for the fuel pump kept blowing. So pop the hood and replace the relay. The problem is that the relays are $16 a piece, and each automotive store we went to only carried 1 of the relays in stock. Of all of the places for his car to break down on Thursday night, it was at a car dealership about 20 miles from here. And the worst part, they knew his car was broken. OUCH, that sure doesn't help for a trade-in. The dealership was nice, they said it was no problem to leave it there overnight. But of course, what were they going to say? He pretty much had to buy a new car! So Friday after work, I took him over to the dealership to look at a car again. 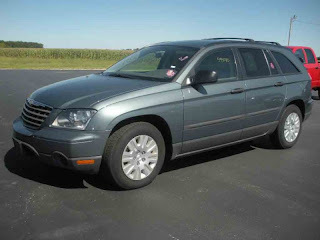 He had one in mind, a 2006 Chrysler Pacifica. They had 2 of the 2006's in stock. Thursday night he had test drove a blue one. He really liked it except he wasn't crazy about the color. The other one was more of a metallic green color but was hard to see in the dark. So we test drove the car, which we both agreed was very nice. And we both really liked the green color much better than the blue. So after a few hours of the hard part of car buying (the paperwork), Douglass had a new car! It was fun to help him with this since this is the first time he had ever bought a car before. And I thought the dealership did a good job. The car was very well priced. We checked online and other local dealers and we didn't find a similar car for any cheaper.